Walking with Jesus: Day 147: Luke 22:54-71 & Psalm 143 - Why Did Peter Deny Jesus? Day 147: Luke 22:54-71 & Psalm 143 - Why Did Peter Deny Jesus? Isn't it strange that Peter would go from swinging his sword and cutting off the ear of the servant of the high priest to denying three times that he knew Jesus in such a short period of time? In one evening, Peter went from bold boasting to sword swinging to vehement denying. Why? 3. When the chief priests came with the Temple guard to arrest Jesus, Peter drew his sword and struck the servant of the high priest on the side of the head, severing his ear. Rather than welcoming his support, Jesus told Peter to put his sword away and healed Malchus. Peter strikes me as a man of decisive action who was not accustomed to being told what to do or to being put in his place. When Jesus corrected him or predicted things he disliked, he had no problem arguing with his Lord and telling him no. But when he was put in his place, when his decisive action was rejected, he didn't know what to do. He wanted to follow Jesus on his terms, ans if his terms would not be accepted, he wasn't sure he wanted to have anything to do with his Lord. Does any of this sound familiar? How often do we expect God to accept the service we are willing to offer, instead of being willing to offer the service He requires? How often do we expect God to bless our decisions rather than seeking to truly submit to His will? 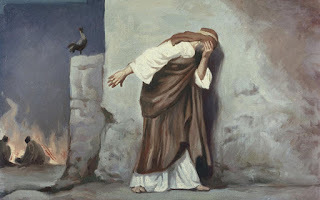 I think that when Jesus looked at Peter and Peter remembered the Lord's prediction (v. 61), he realized what he had been doing, He realized the way he had treated his Lord, and that's why he went away and wept bitterly. Thankfully, this is not the end of the story for Peter. Will we realize how sinful and selfish our approach to Jesus had been? Will we weep for our selfish, sinful attitude, and will we seek to truly follow our Lord instead of trying to lead Him? and no one living is righteous before You. He has come at me with temptation, sin, condemnation, doubt and despair. I remember the redeeming love of Jesus poured out on the cross for me. for I am Your servant. I am Your child.